Give your home or business a distinctive new look with our stylish and budget-friendly luxury vinyl tile flooring. Increasingly popular, LVT flooring is a cost-effective alternative to higher end materials. Impervious to spills, unstainable vinyl flooring is the ideal material for busy households. Thanks to today’s technology and production techniques, this flooring comes in a truly diverse array of styles that give your flooring a luxurious look at an affordable price. Our luxury vinyl tile floor selection is your low-maintenance solution to a captivating new appearance that will complement any interior design motif. 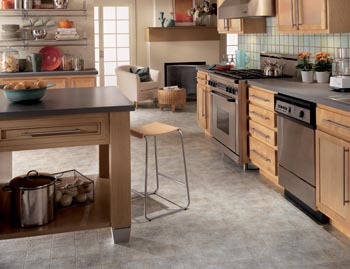 Our knowledgeable associates will gladly help you discover just the right vinyl tile to suit your decorative needs. With so many options to choose from, we know you’ll find the floors that best suit your needs in looks, performance, and price. Our durable vinyl comes in a wide variety of styles. Thanks to today’s advanced production techniques, a luxury vinyl tile floor is your affordable substitute for more pricey materials that may include high maintenance. For example, our vinyl mimics not only wood’s color and general appearance, but also embossed and scraped finishes reproduce wood’s graining and texture as well. From traditional hickory and pine to the worn look of repurposed wood, our LVT options come in a diverse array of styles to choose from. Similarly, these floors can flawlessly reproduce the elegance of porcelain, slate, and virtually any other material. Our vinyl can complement any design’s motif. We offer the top vinyl options from leading brands such as Naturcor and Floorcraft to make your floor look better than ever. Our high-quality, affordable vinyl is guaranteed to give your home a charming, sophisticated ambiance. Not only attractive, vinyl also provides comfort; the material yields some underfoot, so it is easier to stand on vinyl for long periods of time than on harder surfaces. Vinyl is also easier to clean. Resistant to stains and mold, vinyl requires no more maintenance than regular sweeping and mopping. This sturdy material is the right choice for your living room, hallways, dining room, and bedroom, anywhere that takes heavy foot traffic. Choose a luxury vinyl tile floor for an elegant look that will stand the test of time. For the tough job of installing your new tile flooring, make the easy choice and let our luxury vinyl tile flooring installation professionals do the job quickly and efficiently. LVT installation requires qualified installers with professional equipment and tools. Our proficient installation team has the understanding and the skill to lay down your stunning new floor promptly and impeccably. We want you to take pride in your new vinyl flooring, and that demands the proper and precise installation that we excel in delivering. Trust us with your installation, and before you know it, you’ll be enjoying your new floor that we guarantee will last for many years to come. Contact us today to get started on your luxury vinyl tile flooring project. We proudly serve customers in Hammonton, Cape May, Vineland, Ocean City, and Atlantic City, New Jersey, and the surrounding areas.